1. “Recent activities” in the Prospects Report has been removed. The “recent activities” feature in the Prospects tool showed specific pages viewed by anonymous visitors. The Prospects tool will still show analytics about companies, and the individual pages that contacts have viewed are still visible on the contact’s record. This change was put into place due to the European Union’s General Data Protection Regulation (GDPR) being enforced, user feedback, and usage feedback (usage was very low). 2. 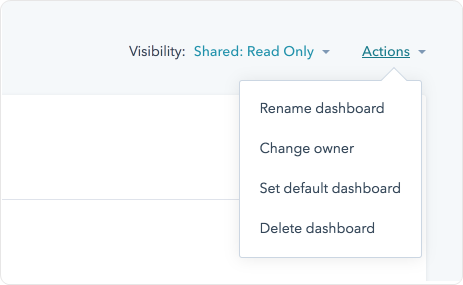 Set a default dashboard and manage your dashboards. Clicking on the sprocket logo in the top left corner of the hub used to default to the Marketing Dashboard. Now, on any dashboard screen, you can click on “Actions” in the top right to give you the option to set a default dashboard. All HubSpot users are now able to restore deleted contacts, companies and deals from the recycle bin in your HubSpot CRM within 90 days of the deletion. Generally, businesses organize their CRM by deleting irrelevant information from it. Sometimes, though, you need that information back for one reason or another. From the contacts, companies or deals pages, click “Actions” and then “Restore contacts”. One exception will be GDPR-related deletions; those will be permanently deleted in order to comply. 4. Create contacts from a form submission without an email address. This feature is currently in beta and will be rolled out to more and more portals until it is live in all portals in the next few months. Within the forms tool, you will now be able to delete the email field from any form. Previously, users had the ability to create contacts manually without an address, or through an import, but now you can do it through the forms tool. 5. New way of associating contacts, companies and deals together on mobile. Now, both HubSpot’s iOS and Android apps can add or remove a contact, company or deal to any record, and associate existing deals to a contact or company record. This is going to be a great feature to utilize if you use HubSpot on the go. It will allow you to see the relationship between different CRM records, and monitor and manage those relationships – the same way you can on a desktop computer. 6. Publish videos to Twitter and LinkedIn. 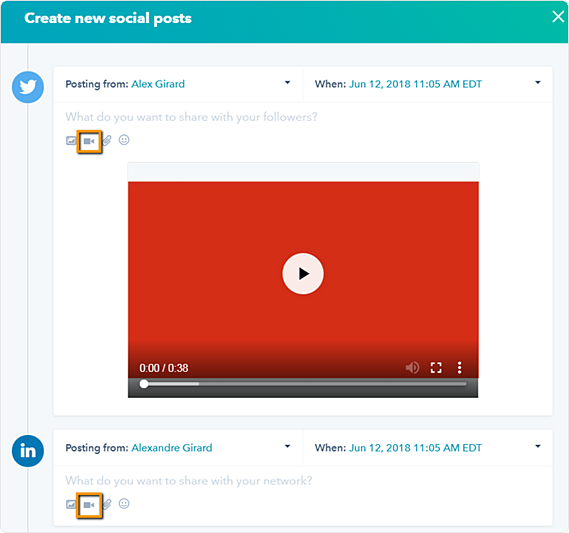 Our personal favorite update coming out of June is the ability to publish videos to Twitter and LinkedIn! (We just hope Instagram is next.) The feature will work the same as posting videos to Facebook. We all know that video rules social - 82% of Twitter’s audience watches video content … so get scheduling through HubSpot! All you have to do is select the video icon when you create a post, and insert a video into a post, just like an image. 7. Easily link to your pillar pages with the Content Editor’s Optimize tab. All HubSpot users now have the ability to add an internal link from a piece of content to its pillar page directly within the optimize tab of the content editor. This update will allow users to quickly copy an internal link to a pillar page to optimize search. It’s fairly simple: after you create your blog post or landing page, publish it. 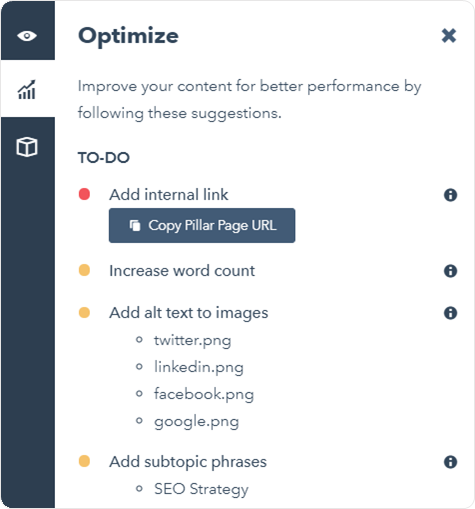 Next, go to the optimize tab in the content editor and you will now see the button to add an internal link within that piece of content to its pillar page. Once you click the “Copy Pillar Page URL” button, it will copy your topic phrase as the anchor text and will let you link your post back to your pillar page in context. This will be available to all Marketing Hub Basic, Professional and Enterprise users. HubSpot has linked the firing of your Facebook tracking pixel and/or your Google site tag to your HubSpot cookie consent banner. Deleted contacts will be removed from any audiences syncing to lists in HubSpot. HubSpot now is syncing lead ad consent fields over from Facebook automatically. These properties will be labeled “FB Consent”. This update was triggered by GDPR and other regulations that give businesses’ contacts more control over their data. How does HubSpot map to Facebook lead ad fields? Still trying to figure out the new HubSpot features? Give us a call!